i now live around the corner from my favorite yarn store—like, literally around the corner—and i haven't been in there even once since we moved more than two months ago. shocking, i know. 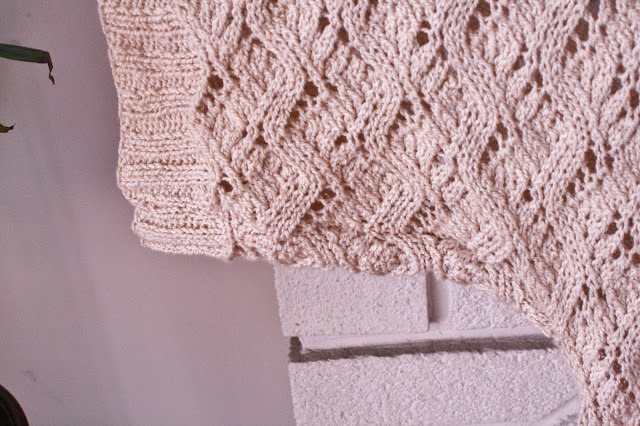 i did, however, find it necessary to pop in for a visit on that snowy day when we first came to view the apartment, and i may have bought enough yarn that day to make a cardigan (for myself, but it doesn't count cause i was celebrating the pending move). 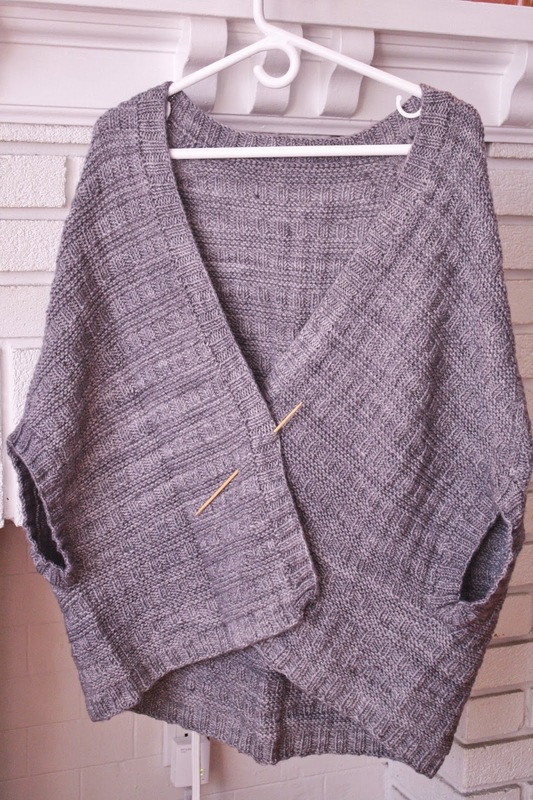 i may have also popped back in a week or so later when we came to sign the lease, and i may have bought enough yarn to make another cardigan (for my mom, so it, also, doesn't count). 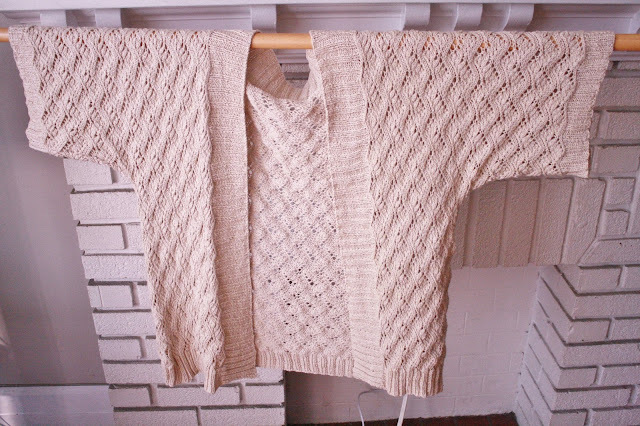 during the first visit, i saw a sample of this cardi-type garment on a mannequin and i instantly saw my mom wearing it (she's fashionable like that). the (unnamed) pattern was designed by the store's owner, and she was offering it for free with the purchase of the yarn. so, of course, i had to go back to get it. [i was trying to steam out the fold lines on the back, but my piece of garbage steam iron chose that moment to self-destruct... after being used like 2 times since i bought it a year ago... but i digress]. i may have also experienced a total meltdown during the last week of pre-moving preparations, prompting me to rip open multiple boxes till i found the appropriate yarn to start this other cardi. 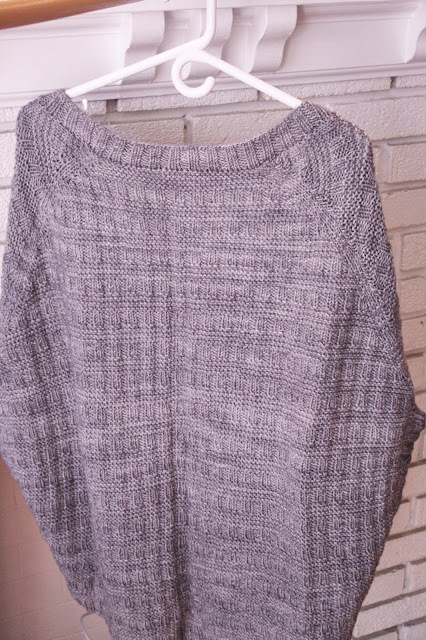 the pattern is Kara by Cecily Glowik MacDonald. i was listening to marathon amounts of the The Fat Squirrel's podcast (more on that at some later time), and she made one for herself in a lovely green, which reminded me that the project was lurking somewhere in my Ravelry queue. it's a Summer-friendly 97% cotton yarn from my stash. 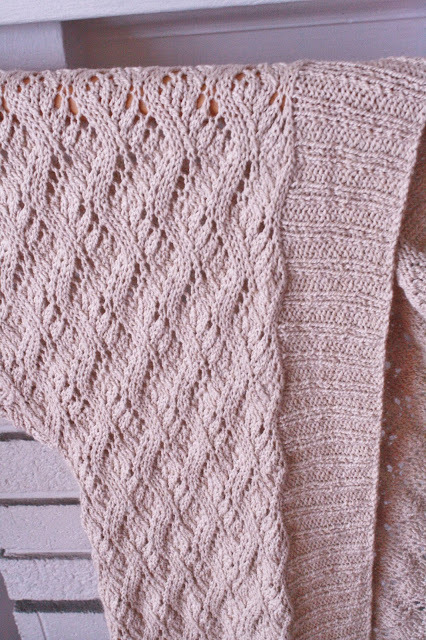 the main attraction of this pattern is that simpler-than-it-looks lace and the very breezy wide collar/ribbing. i made this for me, but i'm sending it off to my mommy... cause i love her... plus it gives me an excuse to make another one for myself. everybody wins!